Well I'm giving intex another try. Last pool we had lasted about 2 years,,,, frame rusted out,, liner was never an issue. 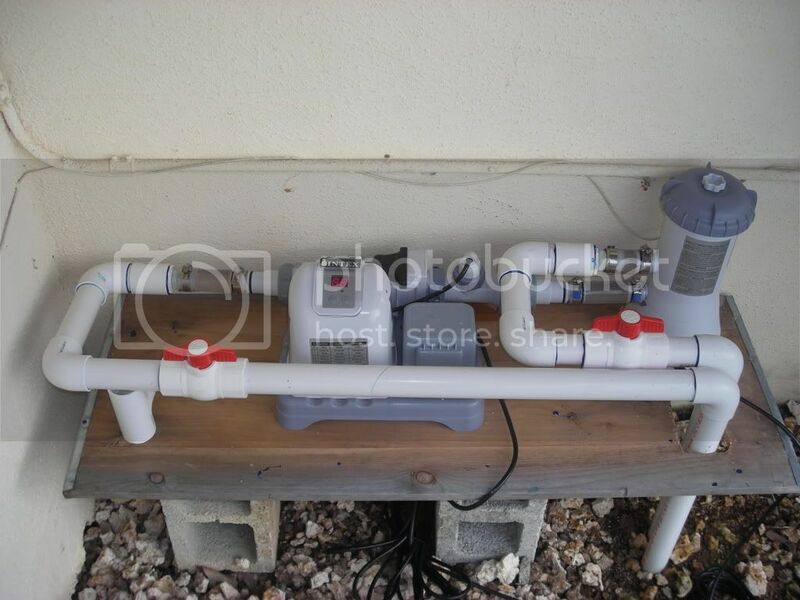 With the last setup I wired up an outlet for the pump/filter and the saltwater generator. It always made me uncomfortable having the electric so close to the pool. There was a couple times where the GFI actually tripped. So with this setup I relocated the electric and moved the equipment away from the pool. I contracted a guy to dig the trench and run about 25 feet each direction of 1 1/2" PVC to relocate everything. Only debate I had about doing it was if the pump would keep up with the extra distance. Well I can tell you it's not an issue. Doubt I've lost any pressure. Here is the setup. I rigged up a PVC spigot for the return line. I especially like the ambiance it creates. 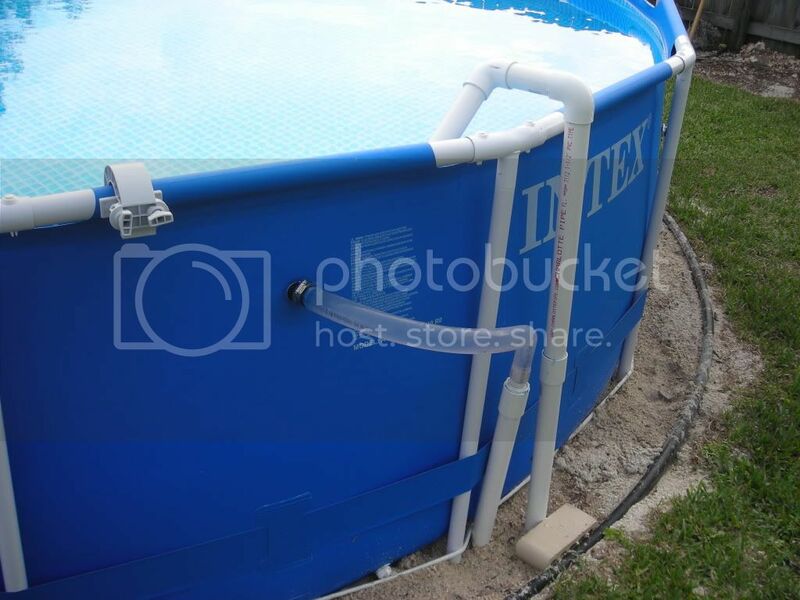 I also rigged up a spigot extension that slips in place to direct the return water straight into the pool for the splash factor. 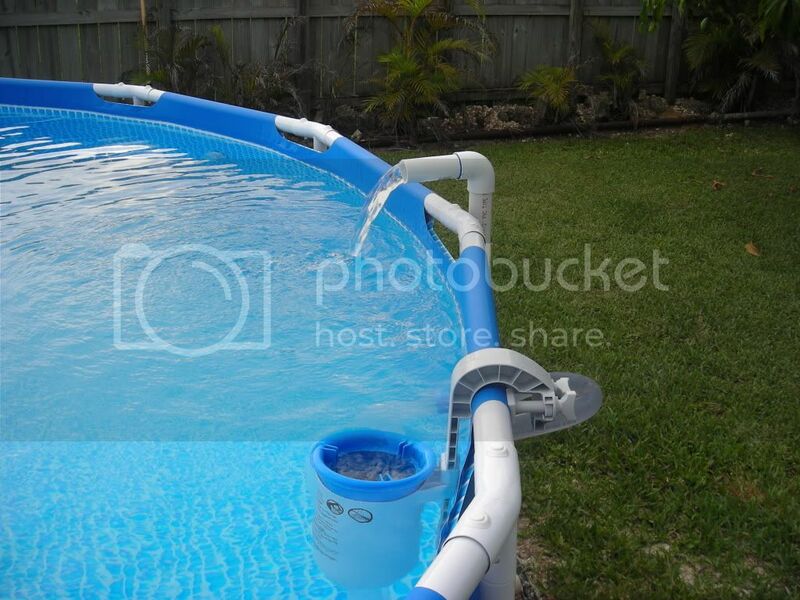 Also giving the extension a little angle starts the water rotation,,, seems to help the skimmer. I'm really proud of the plumbing work,,, I'm no plumbing. I just got a ViSA that gets me in the door at Home Depot. So far It's been flawless from the initial power up. I'm no AGP expert, but I really like the looks of the setup you have going there. Distance from the pool isn't an issue as long as you are getting enough flow to move your water adequately and by the looks of your water, you are. tonight I had a little issue with buildup on the chlorinator plates. I used my air compressor and the nozzle attachment to clean out between the plates. Using the air worked really good and fast. Before I'd use a hacksaw blade to push out the buildup. Now I've learned not to scrape metal against the plates.